China has made much of deals it’s signed with ASEAN. There’s less here than meets the eye. During Premier Li Keqiang’s visit to Southeast Asia earlier this month, Chinese press and media commentators went into overdrive in describing the major agreements that had been reached between China, Brunei and Vietnam to advance maritime cooperation and joint development. On October 13, for example, Xinhua urged other regional states to follow suit and “take up the magic wand of joint development.” A day later, Xinhua also reported a “breakthrough in bilateral cooperation” between Beijing and Hanoi. Despite the hopeful picture that Chinese media outlets have portrayed, a closer look at the actual agreements reached between Li and his regional counterparts suggests that these press claims were actually greatly exaggerated. On October 11, the aforementioned Joint Statement stated that both sides “agreed to enhance maritime cooperation to promote joint development” and they welcomed the agreement signed by the China National Offshore Oil Company (CNOOC) and Brunei National Petroleum Company Sendirian Berhad (PetroleumBRUNEI) on setting up a joint venture. Later that week, Xinhua described the development as “a pioneering move.” In fact, the overhyped agreement was actually a much more modest one that only involved setting up a joint venture to provide oil field services. In October 2011, China and Vietnam reached an Agreement on Basic Principles Guiding the Settlement of Maritime Issues. The two agreed to deal with the easy issues first and address the difficult issues later. Priority was placed on speeding up the demarcation of waters outside the Gulf of Tonkin and, once this was accomplished, they would commence discussions on “co-operation for mutual development” in these waters. The Basic Principles called for China and Vietnam to undertake cooperation in less-sensitive fields such an environmental protection, marine scientific research, search and rescue at sea, and mitigation of damage caused by natural disasters. Additionally, during Li’s visit to Vietnam this month, he and his Vietnamese counterpart, Prime Minister Nguyen Tan Dung, agreed to formally establish three working groups on maritime cooperation, onshore cooperation, and financial cooperation. The maritime working group is to be set up within the existing joint Governmental Negotiation Team on Vietnam-China Boundary and Territory. 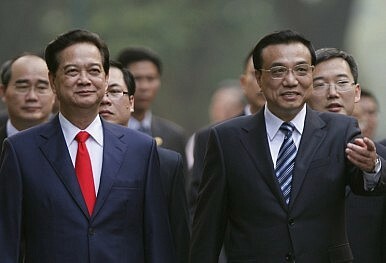 There can be no question that Li’s visit to Vietnam served to keep bilateral relations on an upward trajectory. But claims of a major breakthrough appear premature, regardless of what Chinese media commentators may claim. Li and Dung agreed to “kick-start a joint survey in the waters off the mouth of the Tonkin Gulf” as well as to undertake joint cooperation in maritime environmental protection in the Gulf of Tonkin and conduct a survey of Holocenne-era sediments in the Red River and Yangtze Deltas. US, Australia, Japan Jointly Challenge China on South China Sea IssueThe Danger of Letting China Set the Pace in the South China SeaRevealed: The Truth Behind ASEAN's Retracted Kunming StatementASEAN Foreign Ministers Issue, Then Retract Communique Referencing South China SeaWill Rodrigo Duterte Improve China-Philippines Relations?